If you are currently searching for a party bus in Trenton, then your search has finally come to an end. Here at Rockstarz Limousine and Party Bus, we specialize in providing our clients with a wonderful time when on board our party bus leading to you having a time that you will remember forever. Our Trenton party bus rental option is the perfect way for you to have any kind of celebration with your friends and family. To help, we have sought to make full use of the space available on our bus by designing it in such a way so as to allow you to invite even more people along than ever before. Also, we have included a number of leather seats just to give you all a place to chill as the party continues around you. When it comes to our Trenton party bus service, then the first thing that will strike you is the way in which we can create a stunning atmosphere on board. From the sound system that will blast the music throughout the bus to the laser light show that adds that extra feeling to it all, there’s no doubt that you and your guests will love every single part. In the past, people have also sought to use our services to celebrate a number of different occasions. This ranges from special birthdays to anniversaries, bachelor and bachelorette parties, the list goes on and on. 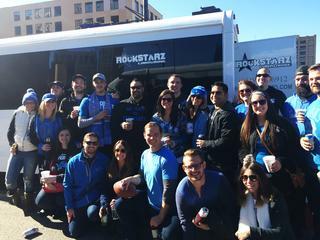 Also, you can look at renting our party bus even if you just feel like having a party with your friends and are looking for somewhere different, the choice is up to you. So, if you live in the Trenton area and are looking for a party bus, then give us a call here at Rockstarz Limousine and Party Bus. The other option is to contact us via our website, and a member of our team will be in touch as soon as possible to discuss your own individual party needs.